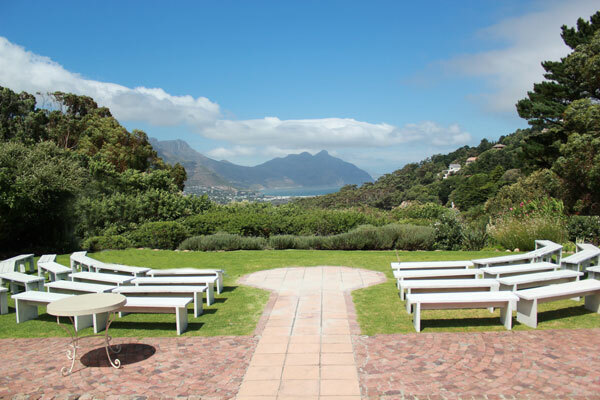 The Suikerbossie is an ideal destination for ending off a beautiful drive through the deep valleys and rolling vineyards of the Constantia and Hout Bay valleys. Watch the bay slowly open up its mountainous arms to you, exposing its icy blue bosom, as your car emerges from the shaded, woodland roads and begins to wind through the coastal republic of Hout Bay. Soon you will arrive at the famed Suikerbossie. It is both a restaurant and a popular venue for weddings. Sit back with some drinks and a superb menu as you gaze out on a private garden that has a view of dreams: the lawn slopes down as sky and ocean surprise you, as if Mother Nature herself has unwrapped and presented you with the greatest of her gifts. On the Rocks, founded 56 years ago, has established itself as one of the leading restaurants in Cape Town. Delicately perched on the rocky shores of Bloubergstrand, waves undulate above the dark and hauntingly beautiful underwater world of the Atlantic Ocean. Arriving along a picturesque coastal road, diners will be seated in the modern, open-plan area with a wall of windows painting nature’s own heaven. If patrons decide to lunch al fresco, they will be transfixed by perhaps the best view of Table Mountain for whom even angels would weep in joy. But Cape Town’s familiar blue waters are not the only things that are able to capture the imagination. Rolling hills and sweeping vineyards fan out from the idyllic setting of Bloemendal Wine Estate in the heart of Durbanville. The allure and reputation of this magnificent farm is homegrown with the exceptional wines made and bottled on the estate. As you settle down for your dinner, you will be treated to warm décor consisting of earthy browns and wood finishes, a gentle, golden glow emanating around the hall from intricate lights below the eaves. Outside, the evening air is fresh as you are greeted by Table Mountain’s dominating visage, jealously guarding its loving children at its slopes. Noordhoek has a curious combination of affluent lifestyles and a rustic charm that is quite unique in Cape Town. Humble surfers make their home amongst the quaint, woodland avenues that wind their way around the area whilst Tuscany villas and sprawling houses perch themselves upon the mountain slopes. But everybody loves a friendly meal and a pint so the trip to the Red Herring Restaurant should be your next destination for your car, driving beneath the forest eaves to emerge facing glorious seaside views. Sitting on its decks, you are able to see the white sands of Long Beach and Kommetije Beach contrasting beautifully with the deep blues of the ocean. We return to Blouberg for this most glorious entry. The Blowfish Restaurant lies on Dolphin Beach and is host to only the finest of Cape Town’s sushi and fish dishes. Diners can sit outside in the glorious sunshine, taking in views of the ever-present Table Mountain which dominates the horizon, or inside where walls of windows allow for a constant view of the unrivalled panoramas. Joining the elite sushi masters are skilful fishmongers who serve at the now famous fish counter, providing only the freshest fish. It is the perfect place to end off a scenic Sunday drive and is suited to romantic dinners too. Hire a Car in Cape Town and make a stop at one of these fine restaurants.